Ping pong tables, colourful bean bag chairs and large communal work spaces occupy the images most of us have of contemporary workplaces. Flexible office design that allows for easy communication and a break down of traditional boundaries between work and relaxation, have been a trend now for several years. They are an outgrowth of an increase in technologies that allow employees to work from anywhere, a move to a paperless office, and a shift towards collaborative models of working. Work environments with natural light are attractive and a pleasure to work in and contemporary office spaces are designed to maximise natural light. This means designing to take advantage of any windows, and moving internal walls that would otherwise block natural light, in order to create large open work spaces. Maximising natural light not only creates an attractive work environment, it can also lead to significant savings to a businesses lighting bills. Forget drab white and neutrals, or being a slave to boring corporate colours. The trend in office fitouts is to create bright and colourful spaces that encourage creativity and are fun to work in. With a move to open office spaces, large walled areas become a blank canvas for bold murals and a confident use of colour. 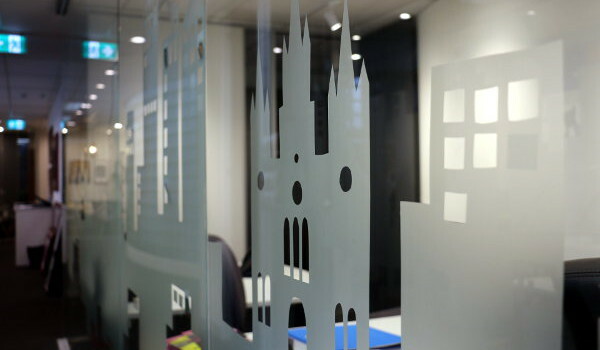 For office spaces with a lot of glass, consider creating a bold branded office design with coloured window film. Decorative window branding can also work as a privacy screen, counteracting any potential fish bowl effect and lack of privacy. For bland office spaces large glassed areas let in the light – reducing energy bills, making work spaces inviting and also providing a canvas for a business to reflect its brand personality. Utilising large areas of glass and blank walls for colour and branding is part of a flexible office design. It has maximum design impact and can be easily and inexpensively removed or changed further down the track. Using energy and water saving technology and design principles, moving to a paperless office, and building in sustainability practices is part of a smart and flexible office design. A business that can sell its environmental credentials will not only excite and attract potential employees it can also lead to considerable ongoing savings for a business. Going green is not only about energy, water saving or food composting. A new understanding of the cost to human health and physiology of office environments has lead to office designs that facilitate flexible working positions. A combination of sitting and standing desks, central work tables and laptop nooks, as well as an emphasis on stair use between levels, are all part of encouraging people to move around, rather than staying seated all day. These ideas are not only better for the body, but they encourage more social interaction and collaboration across teams. In reality the stereotype of the completely open plan workspace doesn’t work unless people also have private work places as well. A flexible office design will have planned co working spaces and also a choice of private areas, where workers can concentrate and can be away from distractions. These spaces don’t need to be lightless boxes, however. Clever design using glass, glass film and sound proofing materials can create private areas that are filled with natural light and comfortable for spending longer blocks of time. Contemporary office designs need to be smart and flexible enough to be easily reconfigured for the changing growth needs of a business. 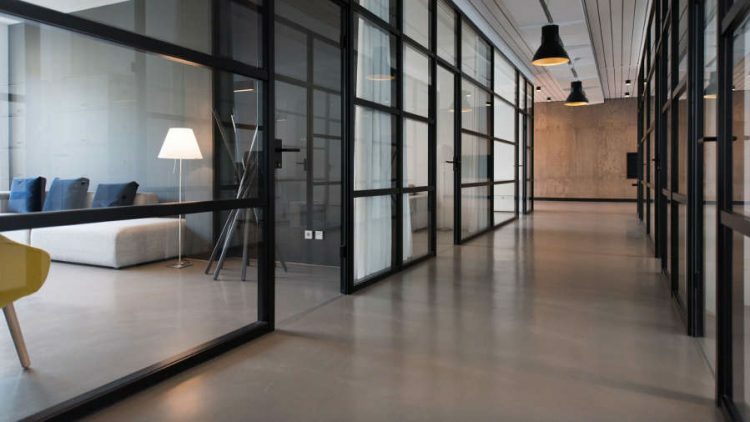 When a business is looking for new office space the most important aspects is finding a suitably sized floorplate that works for its current needs. But what about changes that may take place a few years down the track? It is now quite common for businesses to co-share an office space with another enterprise or groups of contractors. An office fitout that can be inexpensively configured to allow for this and will be attractive to potential co-sharers is considered a part of smart, flexible office design. It has been found that the more employees are able to control their own workspace, the better they perform. This includes an ability to tailor their workstation set up and reconfigure work areas for communal work or solo tasks. This further supports the idea of a flexible office design. User control also extends to staff being able to control the temperature and lighting in their own work area. Dimmable lights and temperature controls that are accessible, so staff can tailor their work environment to suit, are all elements of flexible office design. Apply To Glass designs and installs opaque window film in a range of commercial and residential projects across Melbourne. Window film is a hard wearing versatile product that can be used in large and small projects to address safety and privacy issues and create bold branding designs. Contact Apply To Glass to discuss your next office fitout or office branding job using window film.